My local supermarket has got a little bookshop right behind their checkouts. 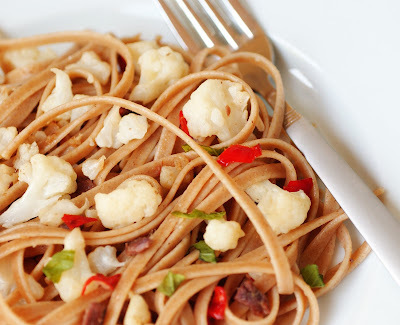 The other day I was paging through some random cookbook and saw this recipe of spaghetti with cauliflower and chilli: a combination that I would never think of. It got me curious and I researched a little on the Internet. Apparently, it is an Italian comfort food, an extension of the spaghetti aglio et olio by adding the cauliflower. I extended it a little more, as I found the mix of of the mild and sweetish cauliflower and the hot chilli a little unsatisfying. The added salty anchovies and the pine seeds definitely contribute to make it a round thing in terms of harmonised tastiness. Cook spaghetti according to instructions. When ready, drain, and reserve 1/4 cup of the liquid. Toast the pine nuts in a dry pan over medium heat for a few minutes, until they become fragrant. In the meantime, cut cauliflower into florets and steam until tender but not mushy. In a large saute pan, heat the oil on medium-high and add the garlic. Saute until the garlic is lightly golden. Add the chilli and cauliflower to pan. Break the cauliflower into small pieces with the back of a spoon, while stirring to coat with the garlic and olive oil. Add the anchovies and toasted pinenutsstir. Season to taste with salt and pepper. Add the spaghetti to the cauliflower and remove the pan from the heat. Mix thoroughly to incorporate. If the sauce seems dry add a tablespoon of the cooking liquid at a time till desired moistness is achieved.